It is great to travel and have some insight by locals and that’s exactly what we do here. 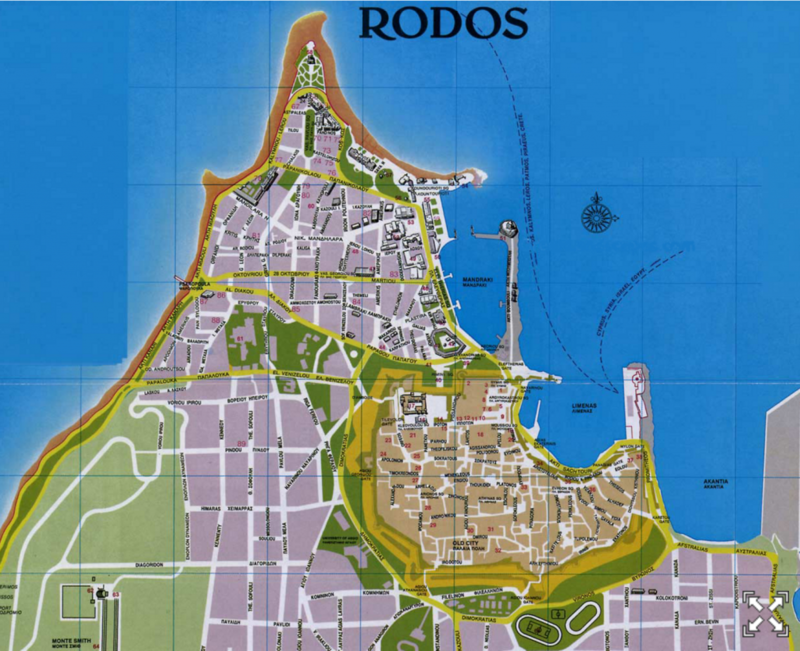 We asked Zaf, our general manager, to suggest one-day trips when in Rhodes. Feel free to ask us for clarifications when you arrive at our venue. 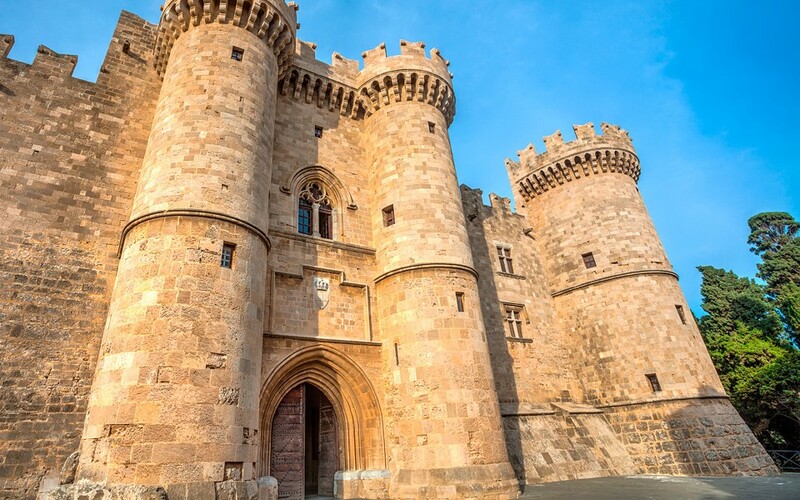 You can start your day trip by visiting the magnificent castle of Grand Magister (Kastelo) in old town of Rhodes. It can get really hot and busy during the day, so the earlier you get there, the better! You can enter from the Gate d’ Amboise, which is the nearest to the castle. It is very impressive as a building both externally and internally. When you are done with your visit, you can take down the street of the Knights, one of the most famous and the best well reserved medieval street in the world! 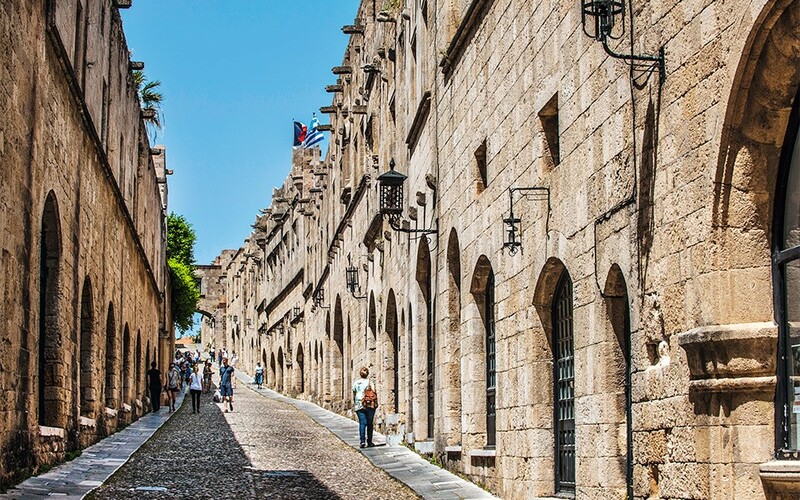 Wandering around Rhodes’ Old Town can be quite an experience, especially the famous Socratous street with the numerous shops, cafes and restaurants. And now it’s about time to go to the beach. Afandou is a great long beach with organized spots and beach bars, but also more isolated spots, away from the crowd. For a late lunch (or early dinner!) one of my favorite taverns would be Limanaki Fish Restaurant at Kolymbia, with a stunning view and exceptional sea food. 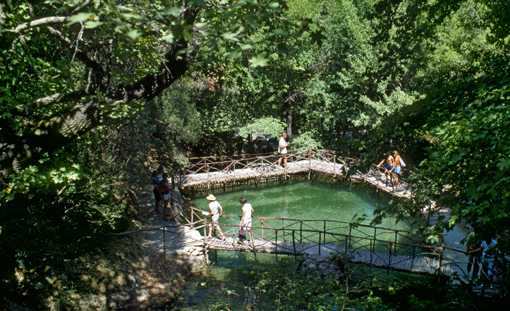 You can return to Kremasti from the road that passes by the Seven Springs attraction – also worth visiting! Do not eat there because it is a very touristic. Drip your feet at the springs and feel the chilled water that just came out of the rock. Do not be afraid to get through the tunnel. It’s a unique experience! Think that this tunnel was constructed by the Italians as a secret passage in case of need. This road continues and passes through gorgeous forest and picturesque villages – you will love it on day light, so I wouldn’t dare it at night. 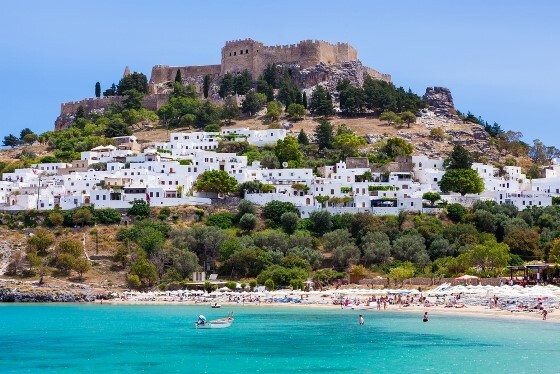 You just can’t have holidays in Rhodes and not go to Lindos. You will love it cycladic style i.e. White houses, blue windows, cobbled streets with shops, tourists and … donkeys !! Sea bathing and relaxing by the sea, in one of my favorite getaways in the island, at Kiotari beach (right after Pefkos)! The best beach bar would be Faros there, where you can stay practically for the whole day, as it is well organized and has a tavern too, to enjoy a light lunch. In the afternoon you can head towards Lindos. You can park in the large parking area, right in the entrance of the town, and walk towards the center. 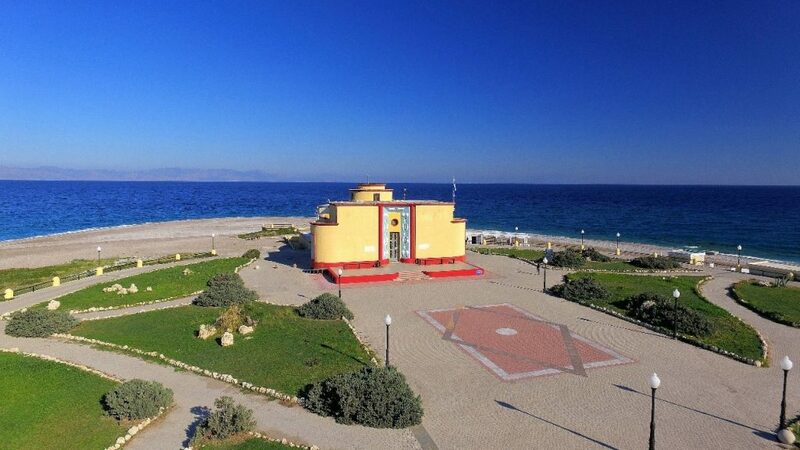 If you want to have dinner there, I would propose the all-time-classic Mavrikos and enjoy its famous pasta with lobster. Melenos has a beautiful view and Broccolino is more casual. I think it might be a good idea to make a reservation first and I should warn you – it can get pricey! Still, there are many options but be careful for tourist traps. Be careful on your way back because at some parts of the route there are no lights all around the road and some turns may be a little dangerous. Mainly do not run at night because the visibility might not be good and think that there are others who do not know the way ! Kallithea Springs. I love this place! Start your day trip by enjoying your breakfast by the sea, in the magical location of Kallithea! You could have a dive at the beach here, or just stroll around the surroundings and visit Rotonda, where usually there are expeditions held (photography, art etc) – a must-see! I will be quite disappointed if you don’t go at the beach bar Ammades – one of the most glamorous beach bars in the island – pretty close at Kallithea springs. They have these huge beds with tend in the first two rows, but they need a reservation first and although you don’ t need to pay for the bed, they have minimum consumption – which is easy to reach if you have two coffees, beers and something to eat. The food is quite great, my boys love the burgers and chicken club-sandwiches. Exceptional for families as there are pools and kids’ pools with water slippers at the back. Ask our reception for details on how to book a bed and who knows you might even spot some celebrities there! For the luxurious dinner of your vacation – I always have one when travelling with my husband – my top pick is The Wonder. You will need a reservation there as well for a table. Worth trying it! My favorite plate is the chicken thai and we also love their salads. 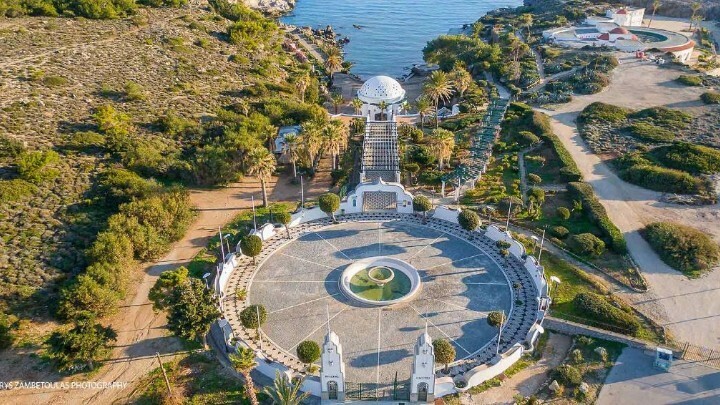 Start this day by visiting the Rhodes Aquarium , built during the Italian occupancy in 1935 and was one of the first of the Mediterranean. It is of a museum value, worth-see! Later on you can stroll around the town, admiring all those buildings constructed the same period (The bank of Greece – former bank of Italia, the Post Office, the Theatre and many (many!) other wonders of architecture, unique in Greece! By noon, you should have finished with this tour (no pressure! ) and head to the south (towards airport). Continue driving until Kameiros and enjoy fresh fish and gourmet seafood at Porto Antico – with beautiful beach at the front. Stay there until sunset, you ‘ll love it! On your way to Kameiros, right after Paradeisi village, you can turn left towards the valley of Butterflies. It is a valley full of trees and running water and of course … abundant butterflies !! Looking forward to welcoming to our apartments! P.S. I have made no deal with the restaurants and beach bars I propose (they don’t even know I am doing it!). They are the ones I go to in the summer with family and friends and they have never disappointed me or my friends!